In May of 2015, Judy and Kristie of Make Room for Bliss proudly published the inaugural “book of bliss,” entitled, “Make Room for Bliss: 365 daily inspirations.” The book, in many ways, is “the best of bliss,” containing the authors’ favorite entries from the Daily Bliss series they have been faithfully writing since June 4, 2012. Divided into chapters on inspirations, encouragements, affirmations, and reflections, the book gives readers bite-sized, readily-digestible bits of bliss, in sufficient quantity to brighten every day for an entire year. Readers may choose to start at Bliss #1 and read one entry each day for a year, open to a random page each day, trusting that the Universe will supply precisely the correct message for that reader on that specific day, or simply reach for the book any time a little extra bliss would come in handy. 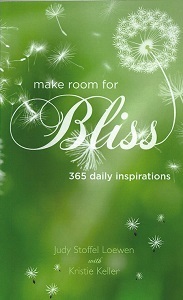 “Make Room for Bliss: 365 daily inspirations” is a fantastic gift idea. Everyone from recent graduates to recent retirees, first-time parents to new empty-nesters, and caregivers to persons dealing with health difficulties can benefit from more bliss, as can teachers, bosses, employees, colleagues, friends, neighbors, and loved ones. “Make Room for Bliss: 365 daily inspirations” is available through Amazon in both paperback and Kindle versions, at Barnes and Noble in paperback, and select Puget Sound retailers. Signed copies are also available from the authors. Requests for signed copies can be made through our contact page, or by emailing Judy at makeroomforbliss@gmail.com. Make Room for Bliss is happy to accept invitations to address your club or group. Contact Judy at makeroomforbliss@gmail.com for rates and availability. Make Room for Bliss has previously conducted lifestyle workshops in Seattle and Bellevue, Washington, at locations including Bellevue Community College. At the moment, there are no Bliss workshops on the calendar. Check back and stay tuned for information about future workshops.